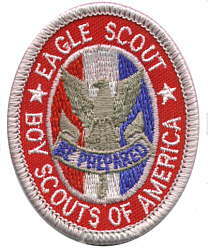 Eagle Scout is the highest rank attainable in the Boy Scouting program program. Since its introduction in 1911, this rank has been earned by more than two million young men. The title Eagle Scout is held for life, giving rise to the phrase "Once an Eagle, always an Eagle." A Scout must earn at least 21 merit badges and demonstrate Scout Spirit through the Boy Scout Oath and Law, service, and leadership. This includes an extensive service project that the Scout plans, organizes, leads & manages. Eagle Scouts are presented with a medal and badge that visibly recognizes their accomplishments.